Home Tags Posts tagged with "climate conference"
The Senate will not approve or appropriate money for anything President Obama might agree to in Paris, and developing countries will not (and should not) stop building coal-fired power plants and using fossil fuels to lift billions out of abject poverty. However, we cannot let down our guard. Negotiators trying to develop a strong climate agreement in Paris face significant hurdles. The goal of the United Nations Intergovernmental Panel on Climate Change’s 21st Conference of the Parties is to produce an international agreement that will reduce greenhouse gas emissions by an amount necessary to prevent a 2-degree Celsius rise in global average temperature in this century. The conference is likely to fail to meet this goal. Bill Nye says that a drought in Syria, caused by climate change, caused the Paris terror attacks. Real experts don’t agree. The climate treaty under negotiation is like a vampire from a bad old horror film. Every time you think it’s dead, it rises from the grave. This vampire is not sucking blood, but money and resources from taxpayers and needy people around the world. It’s time to put a stake through its heart and cut off the head of this climate-treaty monstrosity once and for all. Despite the doublethink inherent in climate change with its intent to deceive, such as when deniers are called liars, it is amazing that the American people ranked climate change dead last among eight other listed concerns in a recent Gallop poll . But will public opinion change in lieu of the Vatican’s recently released encyclical by Pope Francis in which the pope blames climate change on human activity and subsequently refers to the present time as a “pile of filth”? Had the pope bothered to consult scientists and economists outside his select circle of climate alarmists tied to the politically-founded and directed U.N. Intergovernmental Panel on Climate Change, he would have found almost every conclusion reached concerning the alleged coming climate catastrophe, the merits of fossil fuels, and the ability of low-density renewable energy technologies to raise the poor from poverty was dead wrong. In a recent Daily Caller article, Michael Bastach took note of “25 Years of predicting The Global Warming ‘Tipping Point’.” This is the message that the Earth is warming rapidly and, if we don’t abandon the use of fossil fuels for power, it will arrive to wreak destruction on the human race and all life on the planet. Sachs wrote about an event convened by Pope Francis on global warming and sustainability at the Vatican in Rome the prior week. Observing that only alarmists and advocates of population control – most notably, Jeffrey Sachs – were on the program, I decided Heartland should send some real scientists and other experts to Rome to provide a different opinion. The one-day “Protect the Earth, Dignify Humanity” conference, according to BloombergBusiness, “brought together more than 150 accomplished scientists and spiritual leaders from more than a dozen faiths.” The summit served as a teaser of what to expect next month when it is predicted that the Vatican will release a papal encyclical on the “human ecology”—the first time a Catholic leader has dedicated an entire encyclical to environmental issues. On April 29, 2015, Media Matters, a front group and spin machine for the Democratic Party, released another error-filled essay about The Heartland Institute, this one by Andrew Siefter complaining about mainstream media coverage of our presence at a Vatican workshop on global warming held in Rome the previous day. You can read all about that project here. 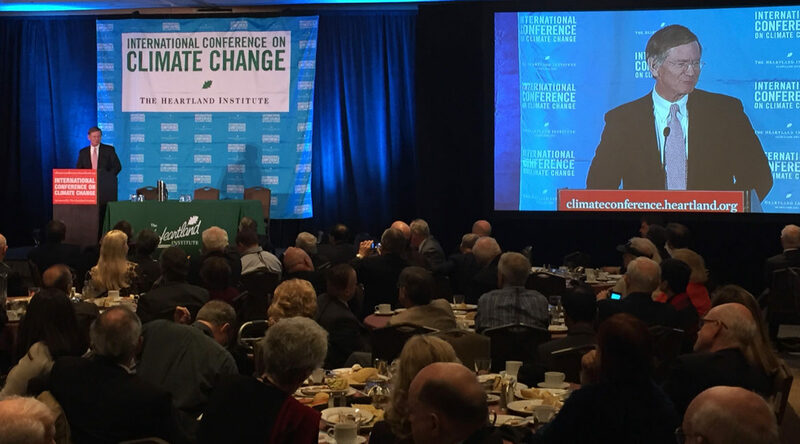 On Wednesday night, The Heartland Institute brought to a close the 9th International Conference on Climate Change at Mandalay Bay in Las Vegas. By universal acclaim from the 600-plus attendees, sponsors and speakers, this one was the best ever. The 6th Panel of the International Conference on Climate Change was based around three men who worked with NASA. The group called, The Right Climate Stuff, focused on the actual facts and data related to the climate change debate. This information filled panel is a can’t miss for ICCC9.